The world has gone digital – well, most of the world has. 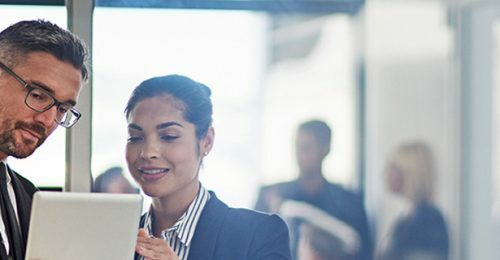 We’ve digitized the way we work, communicate, analyze, predict, sell and buy. The practice of law has gone digital as well. There’s electronic case research, court filings, discovery, records management, video testimony and more. So why do depositions still have to be so paper-intensive? The starkest example is in the use of exhibits at depositions. Imagine 300 pages of engineering-related documents in a patent infringement case. Imagine those 300 pages started life as hard copies at a product design firm. Shortly after the infringement claim is filed, all 300 pages are scanned into electronic form and stored in an eDiscovery review platform. At deposition time, the relevant documents are printed – one set each for three attorneys on either side as well as three witnesses. These files are shipped in cartons to the deposition site because they’re too big to carry. As the session begins, individual exhibits are hunted down and pulled from files, marked up, and entered into the deposition record. After the session, the marked-up exhibits are carted home by the court reporter, scanned, and returned to the attorneys in both paper and electronic format. The cycle of digitizing and printing repeats itself at subsequent depositions, where paper is shipped, pulled, marked up, redigitized and reprinted yet again for subsequent depositions. How many trees is this? It doesn’t have be this way. Productivity – If you’re a lawyer, working with electronic exhibits and electronic deposition transcripts can be far more efficient than receiving, distributing and filing printed, bound paper transcripts and DVDs after every deposition. Some deposition vendors offer a web-based repository where you search for and review transcripts and exhibits online. Or you can download transcripts and exhibits directly into your litigation support software. No more lost documents – So much time can pass between the deposition and trial that many times the paper transcript, exhibits, and video discs get lost or misplaced. Electronic versions can then be available online after the deposition is taken, minimizing the risk of a lost document. This approach reduces costs for clients and helps them respond directly to the Association of Corporate Counsel’s Value Challenge (the industry movement to reduce costs while improving quality). Think of email and how easy it is to search and sort compared with traditional paper-based correspondence – a sack of paper mail dumped onto a conference table. 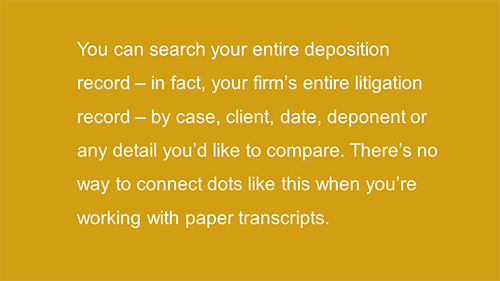 It’s the same with deposition documents.When transcripts and exhibits are digital, you can search your entire deposition record – in fact, your firm’s entire litigation record – by case, client, date, deponent or any detail you’d like to compare. How many plaintiffs claimed whiplash in all of our insurance cases? How many times has this expert testified against our clients? Didn’t we have another malpractice case involving the same physician working for a different clinic five years ago? There’s no way to connect dots like this when you’re working with paper transcripts. We envision a world where attorneys can navigate transcripts, exhibits and all the resources of their firm and the internet at the speed of thought. We’re not there yet, but that’s where we’re headed, and it’s the opposite direction from paper. Digital keeps you young. Well, at least it keeps millennial-generation attorneys happy. They’ve grown up with digital technology, have mastered it, and see it as an extension of their lives, not a newfangled tool they’re forced to learn. They consider powerful legal technology as proof they’ve selected the right employer. Would you be surprised to learn that the average age of in-house counsel is reportedly around 44 and falling? Try giving young professionals information the way they prefer it, in its most robust form. The average document is copied 9 to 11 times and every 12 filing cabinets require an additional employee to maintain. The U.S. uses approximately 68 million trees each year to produce paper and paper products. We know attorneys and law firms love paper. We get it. We just want to paint the picture for those considering a change. A recent look at our own data suggests one in five of our clients have elected to receive deposition transcripts in electronic form only. Half get deposition transcripts in both paper and electronic forms. And one in 10 receive their deposition transcripts in paper only. Whatever your choice, technology is coming and there’s no use resisting it. Slightly over half the respondents to a recent Deloitte survey said technology will be replacing tasks of in-house lawyers in the next five years. “Purchasers want better and more relevant technologies, to be used and shared on integrated platforms,” the report says. If that sounds like you, understand that many of these legal technologies are here, now. Just waiting for you to try them. If trees could talk, they would say it doesn’t have to be like this.